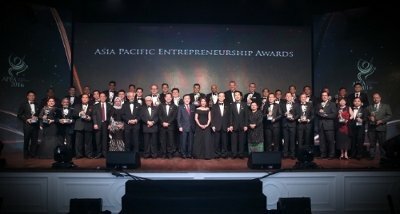 KUALA LUMPUR, Malaysia, Oct. 5, 2016 /PRNewswire-iReach/ -- Forty-One prominent entrepreneurs and business leaders from Malaysia were awarded at the Asia Pacific Entrepreneurship Awards 2016 at a glittering gala dinner at Hotel Majestic Kuala Lumpur. Over 700 attendees were present at the event, comprising of industry leaders, leading entrepreneurs and dignitaries including Dato' Seri Ong Ka Chuan, Minister of International Trade & Industry II, Tan Sri Dr. Fong Chan Onn, Chairman of Enterprise Asia, Congresswoman Gwendolyn Garcia, Deputy Speaker of the Philippines, Dr Eugene Chien, former Minister of Foreign Affairs of Taiwan, and Dato' William Ng, President of Enterprise Asia. The Asia Pacific Entrepreneurship Awards (APEA), is a distinguished regional recognition platform organized by Enterprise Asia, the region's foremost association and think-tank for entrepreneurship. The Awards are presented to selected entrepreneurs across Asia Pacific each year, with award ceremonies held in over twelve countries. Nominations of the Awards itself is by-invitation, from past and current awardees, a supporting trade association or the organizing committee of Enterprise Asia. Nominees are then subjected to a series of rigorous tests, including financial verification and a compulsory site-audit and interview, culminating in a confidential balloting process. "We can say with certainty that the recipients of the APEA are like no other. Not only do they have to prove their entrepreneurial skills and experience, they also subject themselves to a pledge to uphold the high standards, which includes allegiance to the two founding pillars of Enterprise Asia, namely Investment in People and Responsible Entrepreneurship", says Dato' William Ng, President of Enterprise Asia. The recipients in Malaysia were selected from among 180 shortlisted candidates, ranging from talented young entrepreneurs to experienced industrialists. Among the successors in the respective industries, pioneering the transportation and logistics industry, Datuk Kumar Prabakaran, the Founder and Managing Director of Giga Shipping Sdn Bhd said "Winning the prestigious APEA is an honour for me and GMG to deeply cherish; as it is a recognition of our success in pioneering Malaysian Automotive Logistics". When he sets his mind on an endeavour, he dedicates his efforts in ensuring success. Tan Sri Dato' Sri Low Keng Huat also quoted " Determination and hard work are essential criteria to become a successful entrepreneur". The Executive Chairman of Low Keng Huat Berhad believes that the employees are the company's source of strength. "Winning APEA will put Phyto Science success story as an icon in the MLM industry" said Tan Sri Dato' Sri Lai Teck Peng, Founder of Phyto Science Sdn Bhd. he believes years of patience and perseverance are the essential attributes of success. Dato' Sri Dr. Eric Yap, CEO of Technology Revolution On-Net Sdn Bhd (TRON) said, "Winning the APEA, personally it gives me added confidence to continue with my creativity and forward growth within my industry. Professionally it gives credibility to our business especially when exploring our markets internationally". He takes pride in being able to give back to the society and CSR activities, being the first in the region to embark on such a journey.